A successful hardscape design will do more than serve as a functional outdoor space. It will help lead your eye through the landscape. 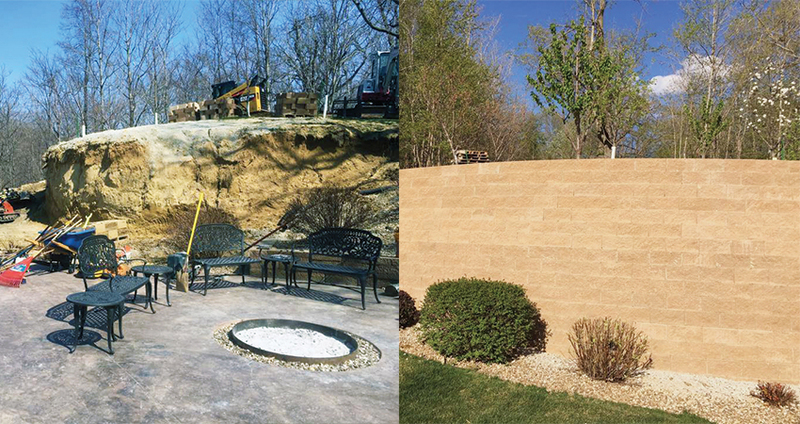 Among the many different hardscape services we have experience with are retaining walls, patios, fire pits, low voltage lighting, plant beds, and edging. We have worked with both residential and commercial properties around Marion and Cedar Rapids, Iowa. We strive to make the process from design to finished installation an enjoyable one. Retaining walls can turn a hilly yard into a usable area for the family to play. Retaining walls help to fix washout areas and mowing issues on otherwise unusable terrain. Free standing walls and pillars add seating to your patio and fire pit combo area. Paver patios and walkways make the area a functional part of the property for entertaining family and friends. Low voltage lighting will allow you to enjoy your landscape and hardscape at night. Landscape lighting may include path and step lighting, uplighting and downlighting of your home's architecture, and pool and deck lighting. It also adds a component of safety while navigating around your hardscape and landscape at night and overall home security in the nighttime. Landscape lighting technology has come far in recent years with energy efficient LED lighting systems, some of which can be controlled by devices! Our goal is to make the process of transforming your yard into the outdoor space of your dreams. Our designer will work closely with you to design a unique, functional, structurally sound hardscape design. Whether you just want a low maintenance landscape, or you would like the yard for get togethers for family and friends. Country Club Lawn Care & Landscaping can also offer grounds maintenance of your property after the installation of your hardscape is complete. Walls, patios, makeovers, burms, and custom lighting...everything. Outdoor living for residential and commercial properties. At Country Club Lawn Care and Landscape, our committment is to provide you with a landscape design that meets all of your expectations and a landscape that you will enjoy for many years. When is the best time of year for hardscape installation? Generally the best time of year is early spring. However, hardscapes can be installed year-round as long as the weather conditions allow. In our Iowa climate the weather conditions allow us to move terrain right up until the ground freezes. Please fill out the Landscape Survey. Once completed, one of our representatives will meet with the property owner or manager. We’ll then determine if a computer-generated design is required. If a computer-generated design is unnecessary, a quote or proposal is created and returned within a few days. If a computer-generated design is needed (requires 1-6 weeks, depending on the complexity), we’ll complete the drawing and another appointment is scheduled to review any modifications and to finalize the design. What is included in a hardscape consultation? It is a walk about with our designer to find out your wants, needs, likes and dislikes. It will include hardscape design ideas. It is a chance for our designer to get to know you and your property and what we can do to enhance it.